I am a little behind in wishing you all, my dear readers, a happy 2009 new year, non ? But then, I’ve always been told that it was quite all right to give one best wishes until the end of January. I, of course, will not be able to forget 2008. What an amazing year it’s been in our life! So rich and fulfilling! First, there’s been a lot of fun and exciting trips that P. and I took, each different in style, each leaving us with memories of good times; there’s been rewarding work accomplishments, like continuing to contribute to the Boston Globe Food Section or working on the photography of a talented baker’s cookbook (not yet released, but I will let you know when that happens). And there is more to come. In 2008, I’ve cooked a storm, I’ve taken and styled hundreds of pictures — anyone else having digital storage issues? I’ve bought way too many cups, bowls, cutlery and plates, as I am constantly reminded by my darling P., and I’ve enjoyed every piece of it all. But in 2008, there’s been something larger and more challenging than anything I have ever done before, something no one can ever prepare you for, something much tastier and more enriching than all of the cooking, styling and photography combined, that regularly happens in my house. Well, you know of it. 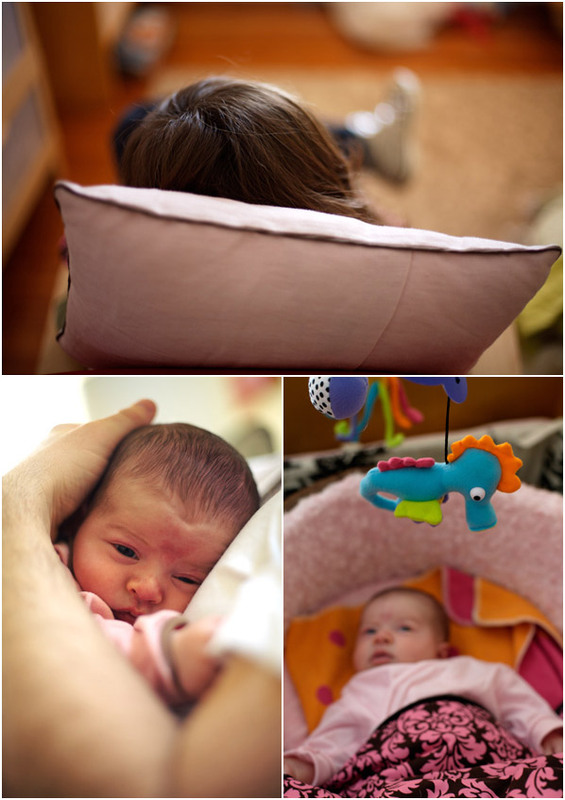 It started with carrying our small treasured bébé in my belly during nine months in 2008. What a journey it’s been! So natural and common. I, for one, can vividly remember when P. and I found out that I was pregnant. It was the day in late April when we left for Italy. It’s funny to think about it today. We were somewhat panicked, overwhelmed and excited, I recall, about what was going to come next. And so, naturally, this piece of news changed entirely how the year unfolded for us. In such a rewarding way — we know that we are lucky. During all these months, you’ve kept coming to visit my blog to say hello. You’ve always been here, to leave me encouraging notes, share stories, ask questions, and chat about food and life — the good stuff! I cannot thank you enough for that. While I do not have the time anymore to respond to every comment you leave individually, know that each matters, and makes me smile. So thank you, once again! So to finish 2008 and start 2009, let me share a story and recipe with you. The story of this berry pavlova. When I made this dessert, I had all the intentions to taste and enjoy it, but I never got to it. And let me tell you why. On December 23rd, P. and I had made a plan to have a casual dinner with four other dear friends before the craziness of the holidays and the arrival of bébé. My friend L. was very pregnant too. And so the day flew by. In the morning, I drove downtown to buy last minute Christmas presents — this is how unprepared I was this year. I baked cookies which I styled and took photographs of too, I made panna cotta and later in the day, I set myself to prepare my dessert. Of all things, I chose to bake a pavlova. At five O’ clock, I was in the car driving to the next town, feeling happy at the thought of how good it would be to have my entire body relax. “Oh I cannot wait,” I kept repeating all day. A. was never given the chance to finish the massage. Ten minutes after she started, my water broke and labor started soon after. Lulu could not wait; she was on her way to discover the world. Before driving to the hospital, we stopped home to finish packing our bags, and have a bite to eat. “I will bring you food,” J. told us on the phone when we called to tell that we would not be able to come for dinner. I was just relieved that it would not be wasted, and that our friends would enjoy it thinking about the new adventure ahead of us. Lulu is four weeks today. Already. Life has changed. Life tastes better, despite the tiredness and the puffy eyes. I am told it will get better. We are happy, overwhelmed with feelings I did not know before. Every day, I learn something new — and I am challenged. And every day, I continue to cook. Whatever it is, even if extremely basic. “Stop cooking and rest,” my friend N. told me when I told her about the lamb tajine we ate for dinner last night. I laughed. Rest? Of course, she is right. But stop cooking? She does not know me well enough! Lulu and I have already made cookies, soups, stews and salads together. I like to talk to her and tell her what I am preparing as she stays close to my chest, cozily nested in a sling. Of course, she sleeps through most of it, but I still wonder whether she notices already the smells and pot and pan noises in the kitchen. So naturally, I want to dedicate the recipe for this pavlova to our little princess. One day, P. and I will tell her the story of how it happened. She might smile and find it as special as we do. Happy New Year everyone! May you have a wonderful year. And thank you for being here. Preheat the oven at 270 F and place a rack in the center. Line a baking sheet with parchment paper and spray it with oil. Dust with cornstarch and remove the excess; set aside. In the bowl of a stand mixer, add the egg whites with the salt. Whisk together until soft peaks form while adding the sugar gradually. The texture should be thick and glossy. Add the cornstarch and continue to whisk until just combined. Spread the meringue on the baking sheet and bake for about 1 hour. Turn off the oven and let cool inside. Whip the cream firm with a little sugar and once ready to serve, top the meringue with it. Add the fruit ( I crystallized mine) and sprinkle with grated coconut, if you like. Préchauffez le four à 130 C. Couvrez une plaque de cuisson avec du papier sulfurisé et huilez-la avec un spray. Saupoudrez de maïzena et enlevez l’excédent. Mettez de côté. Dans le bol d’un mixeur, mettez les blancs d’oeuf avec la pincée de sel. Battez-les en neige, et ajoutez le sucre progressivement. Continuez à battre cette meringue jusqu’à ce qu’elle soit lisse et brillante. Ajoutez la maïzena et mélangez jusqu’à ce qu’elle soit incorporée. Etalez la meringue sur la plaque de cuisson et enfournez pendant environ 1 heure. Arrêtez le four et laissez la meringue refroidir dans le four. Au moment de servir, battez la crème en chantilly avec un peu de sucre et étalez-la sur la meringue. Ajoutez les fruits rouges et sapoudrez de noix de coco, si vous le souhaitez. Que Lulu est magnifique. J’aime bien lire un nom au lieu d’une initiale. C’est plus personel. Cette histoire me rappele la naissance de mon 1ière enfant. Ma fille est née une semaine en avance et j’avais un ami pour souper. Nous avons du le quitter. Il a tout ramassé. Ces petits enfants apportent tellement de joie dans nos vies. Nous en avons eu deux autres. Et que d’amour nous avons à leur donner. Elle est bien chanceuse d’avoir une mère comme toi. Nice pictures of you and Lulu! Your pictures are always so inspiring. I can’t wait until is a little sunnier to try a pavlova. Lulu is so beautiful! My older sister had a birthmark on her forehead just like hers. Stop cooking? What an abomination. Besides you do have to eat everyday (hence you need to cook). Les deux grandes passions de Béa ! Et nous, on se régale à lire la jolie histoire du gâteau & du petit bébé, qui nous dessine un grand sourire au lèvre et fait perler une larme aux yeux ! what a lovely post and beautiful photos! rest when you can, cook/bake when you can!! Je lis votre blog depuis quelques mois maintenant et je suis en admiration devant toutes vos recettes et photos. C’est donc tout naturellement que j’ai ajoute mon vote pour ces awards. Felicitations pour votre adorable petite fille et tous mes voeux de bonheur pour 2009. What a lovely story Bea. I’m impressed that you are still hard at work in the kitchen – good on you! Maybe the early cooking lessons will turn Lulu into a master chef one day! Congratulations on being nominated, such an honour! Quelle jolie histoire à raconter à Lulu quand elle sera plus grande, pour avoir vécu la même aventure humaine cette année je partage tes sentiments, je te souhaite mes meilleurs voeux et envoie un doux baiser à Lulu. So lovely post! And photos! You girls are super cute! C’est une si jolie histoire ! Merci de l’avoir racontée. what an amazing year you have had bea… congratulations on everything good that has happened from work accomplishments and to your little lulu. she is so beautiful! amazing photos. so dreamy. Congratulations on being nominated. I voted already – for you of course. And I think we all want to thank you for the wonderful blog year you gave us. All the stories, photos and recipes. Thank you. Oh such a sweet, sweet story; you totally made me tear up. What a lovely story. I’m sure you cherish it as much as the dessert. How wonderful! And you look absolutely beautiful – you glow with happiness! Congratulations for so much. Thanks for sharing the story of Lulu’s birth. She is such a doll! The joy you both feel really comes through in your photos. I just voted for your blog, you can always count on me. Bonne chance! P.S. I have to share this. I just baked for the first time with agave nectar. I’m really impressed. I made a pear frangipane tart. It had a very natural sweetness. Have you ever used it? Congratulations for Lulu’s and the nomination. I am a silent admire of your blog. Love the style and the color of your pictures. I am voting for you…..good luck ! Congratulations, Béa! And yes, it does get a lot easier, especially the sleep part of it, if you see what I mean 🙂 Also, if I may make a suggestion, learn to make double batches of food and freeze a half, I have been cooking that way since my daughter was born and it is a good way to eat good food fast. amazing blog. cute pavlova that i will try soon! and congratulations to little LuLu, she is so adorable! Tu as la plus excuse du monde pour envoyer tes voeux maintenant. La prochaine fois que je mange une Pavlova, je penserai à toi et à Lulu. La plus belle excuse, bien sûr. What a sweet story. My little one, now 11-months old, loves to be in the kitchen with us. He is so eager to watch, to touch, to taste. It thrills me! I’m sure your little one will be clinging to your knees or resting on your hip so she can watch, help, and taste all the good stuff mama so lovingly makes. Congrats again and again. A beautiful pavlova, but an even more beautiful story. Thank you for sharing your story, your images, and your recipes. I have Celiac and love that you’ve injected your blog with so many gluten-free recipes – in a way that feels natural and inclusive for those who just love food. Merci à toi pour ce partage si touchant. Lulu certainly made a grand entrance! Such a touching story! Enjoy your time with her and your hubby. I look forward to your updated posts everytime, your photos are exquisite and I love that we get to see bébé Lulu as well! What a beautiful baby…Felicitations! I stumbled upon your site one day and now come back often for a bit of eye candy and, if I feel daring, sometimes attempt one of your masterpieces. We had a little London Lulu of our own in the fall…I hope you enjoy yours as much as we do ours! Oh what a sweet story! And somehow pavlova is an absolutely appropriate dessert for such an occasion. Beautiful, light and whimsical. Très bonne année 2009 à vous, P. et Lulu. Thanks so much for sharing your beautiful story about Lulu. I am sure that she will be proud on your pavlova recipe that you shared with us here. Enjoy your parenthood B! Notre dernier petit-fils a aussi un “copywright”unique comme Lulu..C’est Noah:)J’adore son trademark~Son papa l’avait aussi. Le pavlova est magnifique..vos photos aussi. Toute croquante! Vous aussi..si jolie! What a wondeful story, I’m sure LuLu will love to hear how this Pavlova is dedicated to her when she’s older. Both you and the baby look beautiful, all the best and a happy new year! Bea, It has been a pleasure visiting and and reading your blog!! This post is wonderful in the fact that it has a beautiful story behind it told in a mesmerizing way!! I could not take my eyes off your page!! I sincerely wish you all the best in 2009, and congratulations on being nominated! I will barrack for you because you deserve to win!! I am honored you shared some of your 2008 with me and I feel so happy to read you on in 2009! Lulu est un tresor et etre maman te va si bien! Belle histoire a lui raconter! Bea, it’s a wonderful story. That’s true that a baby changes a whole life. For better, of course. And time goes by so quickly, every moment of the childhood of our kids is so precious, special and different. My daughter is almost five and she has her favourite cookbooks too (about cakes and cookies obviously!). I think it’s a miracle to be a parent. Have a nice year too! Thanks for sharing with us your passion and beauty. Magnifique billet, Bea. J’adore le final, les photos de lulu et des cookies cote a cote: les passions de Bea. Repose toi un peu quand meme, il faut tenir sur la duree. 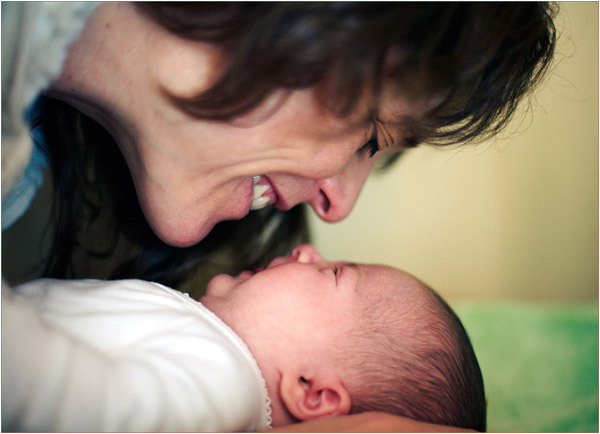 Bea- a beautiful story, dessert and- of course a beautiful baby with such a beautiful name! 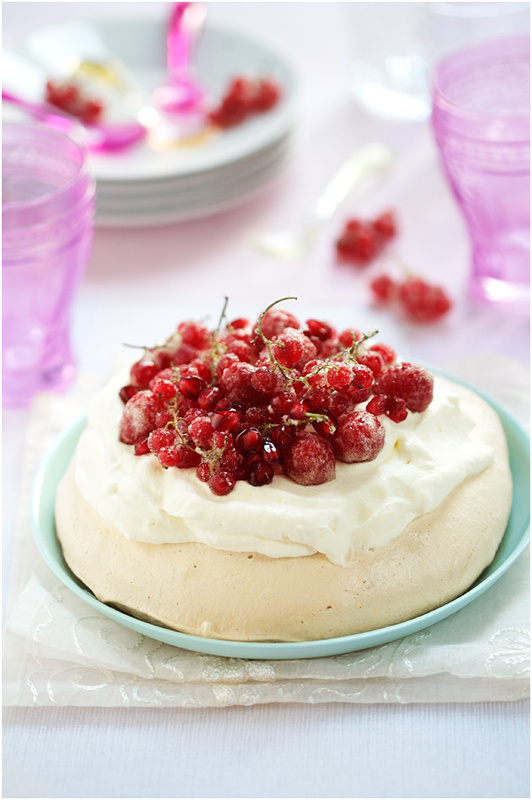 Now.. are those red currents and raspberries on the top of your pavlova? Here in the south, we do not ever see those- I will use other fruit but would love to try fresh red currents. Bea, You have my vote. I LOVE your blog. It’s the FIRST food blog I ever read, and it set a standard for me. Lulu is quite blessed to get cooking lessons so early. I love how you crystalized the fruit. So gorgeous! Lulu is adorable and I give you a lot of credit for creating in the kitchen and then blogging too! I love your blog, everything you cook has a wonderful story behind. Baby Lulu gets more and more beautiful!!! That is the best excuse I have ever heard for not eating dessert! Toutes félicitations et meilleurs voeux pour la nouvelle année avec Lulu. Oh, Bea, you are so smart to have Lulu in the kitchen with you while you bang the pots around to cook! I was too timid and afraid the noise would wake my son from his sleep, so it took many years before he learned to sleep through my cooking sounds. Lulu is so precious and will grow to share stories of how she literally grew up in the kitchen with all its warmth, sounds, scents, and love. The rhythm of the kitchen will be as natural as breathing to her, the way it is to you. That’s a beautiful gift to give her and to share with us. Many thanks! Bonne Année Bea. Que cette année vous apporte a vous 3 encore plus de bonheur, d’amour et de prospérité. Lulu est adorable. Un beau trésor. Moi j’ai Lola (5ans) et Catalyna (18mois). Un enfant est le plus beau cadeau qu’on peut recevoir. Le temps passe vite, alors jouie de chaque moment avec Lulu et continu ta passion de création. Tu m’inspire beaucoup. Et je crois que je vais bientôt changer de carrière à cause de ton blog. J’ai aussi une passion folle pour la création de menu et la photographie. Merci Bea. Ce dessert est fantastique! Mais dis-moi, l’as-tu fait au temps des groseilles l’été dernier? Si non, où as-tu déniché ce fruit à ce temps-ci de l’année..? From my very beginning my mom talked me through recipes while she cooked. I attribute my cooking ability to her. I hope your little one will too. Congrats. that’s a lovely story that lulu will like hearing over and over. she looks adorable and you look absolutely radiant. LULU, autrement dit nos enfants, sont les merveilles de notre vie! Bonne chance pour toi, pour cette merveilleuse MAMAN, et une tres grande chance pour princesse LULU de toute sa vie! Alors moi je découvre votre blog et je suis en admiration devant tout : les photos, le pavlola, Lulu… Bravo ! How wonderful – to have a dessert named after you! Lulu looks adorable! I stumbled upon your blog a few months ago when I decided I would commit to reading a food blog here or there since all my writer friends kept telling me I was behind the times. I must tell you, I thought I would find a food blog boring! Nothing to page through! Too few lucious photos! Well, you converted me. Every couple days I find myself curious to see what you are cooking and to read more of your story. It has been a treat to discover your world from my own kitchen table. I never imagined I would enjoy it so much. All the best, and cheers from Philadelphia. best wishes! happy new year! and much love to bébé Lulu! I love your blog and your photos are especially amazing! Makes me want to learn to be a better photographer. Congratulations on beautiful Lulu! Lulu’s so beautiful. The pavlova looks delicious – I would like to try it. Just yesterday I voted for your blog. Easy choice. Congrats on Lulu; whose name I love . WIshing you a year that tops even the last one! I have been reading your blog for some time now…this is my first time commenting. First of thank you! 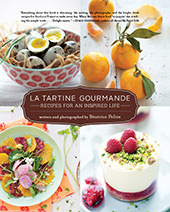 Thank you for the inspiring recipes and photography. Second, reading this entry made me feel teary-eyed, since I had my own bundle of joy several months back and continue to cook with her by my side – time flies! this will be a great memory for you and a wonderful read for her. What a serene and loving way to spend your days with her. She is is just beautiful. Beautiful story, Bea! Precious bebe, too!! 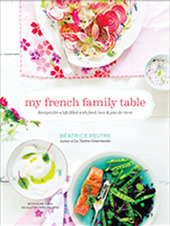 Can’t wait to learn of her cooking journeys with you. Pavlova is such an underrated treat to make. Light, tasty, easy to prepare and so delicious. Congratulations for the nominations! I am sure you will be the winner. Thanks for all your hard work in your blog. What a beautiful bebe! The pavlova looks amazing, and what a great story! Je reviens chez toi et je tiens à te dire que votre petite Lulu est vraiment très belle, un bien beau petit trésor! Congratulations again on such a beautiful little trésor. Your writing, your photos and your little Lulu are all incredibly beautiful. Truly beautiful – baby, Momma and Pavlova. Such a wonderful story, but the pictures more than tell the story. Your little Lulu is a precious angel. Your comments are so sweet and nice to read. Many thanks! I feel blessed to have, with P., such a sweet, healthy baby indeed. Every day, she changes and brings more joy. I love now that she smiles, and tells me in her own way, what she likes and dislikes! And as to the cooking, I cannot wait to do more and more with her. Miss Diane, the berries were actually bought at this time of year, believe it or not. Totally not local 😉 but I could not resist when I saw them. I take that they were in the stores because of Xmas. Such a wonderful story! And a lovely bebe 🙂 Lulu is every bit the beautiful princess! Beautiful story and a beautiful baby as well. The pavlova is a treasured dessert! I just came by this blog and its absolutely wonderful. Heart warming tale of life. babies always spring strange surprises & i guess one can never be prepared. She’s is a real beauty & yes, cooking is like eating,drinking etc. How does a foodie stop going into the kitchen? The pictures are gorgeous…all the best always. You are a beautiful Mom!! Congratulations Lulu is adorable. 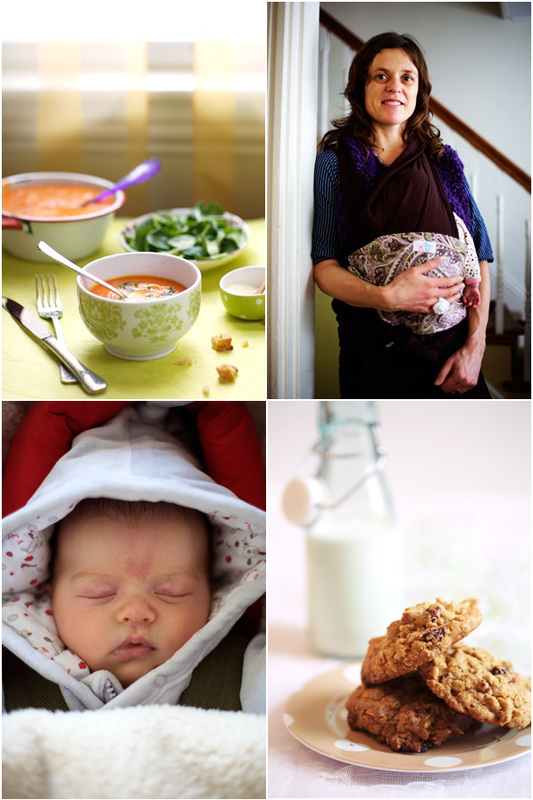 I used to carry my baby in the sling too so we started to cook together since he was born :-). Enjoy these wonderful moments despite the tiredness, every day will be a new discovery, a new way to look at the world through your daughter’s eyes. You’ll notice things that you took for granted but instead will have a new meaning for you. Bon Voyage! I have just found your blog from a link on Shimelle.com I love the look of your food. I too made a fabulous dessert before my first son was born, I go to eat mine, but threw it up while in labour!!! So maybe just as well you didn’t eat the Pavlova. Enjoy cooking with Lulu while she is unable to move too far, you will have to find another way soon. Wow, Lulu has grown so much and she’s chubbier.. I’ve been ‘left’ out of your circulation cos of the suspension of my email account due to a spam and am catching up with your blogs. Very interesting story about Lulu’s entrance into this world. Reading your article made me chuckle.. so like mothers we are.. I was reading a long fairytale story to my daughter when she was just a month old.. my helper was looking on and probably thinking I’ve gone abit mad haha..
Congrats Bea on you achievements and accomplishments for last year and most of all for the blessings and joys of the arrival of Lulu. Waiting for the favorite chocolate cake recipe! Hurry! And all blessings to petit Lulu! Not only is you baby adorable, but the berry Pavlova has made my mouth water so much that I’m actually going to make some for the family for dinner tonight! Your blog is absolutely amazing. Your photography is really top-notch, and makes such a difference to the blogs populated with stock photography!